Established over 50 years ago in 1956, we have always been and continue to be a locally owned and operated company. We have committed our careers to fulfilling the lighting needs of Central and Eastern Washington. Offering products from the leading manufacturers in the lighting industry, we consistently work to provide high-quality selection and service. We are all ALA certified and trained for lighting consultation and design. We would love to help make your space beautiful. We are a family run business, committed to our employees and customers. 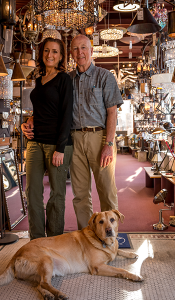 Inland Lighting was established in 1956 and our family has owned it since 1992. Proud of our long and impressive legacy, the Inland Lighting team consistently strives to uphold the reputation for excellence established by our founders in 1956. We have all worked very hard to become your favorite Top Rated Local® lighting specialists. Jim is the owner of Inland Lighting and has more than 25 years of experience in the lighting industry. An integral part of our team, with over 17 years of experience, Tina recently became a Certified Lighting Consultant (there are only 3 in the entire state of Washington). With more than 15 years of experience in the lighting industry, Denise is a valued and important part of our team and an ALA Lighting Specialist. Joined the team in January 2009 as a 9-week old pup. He quickly learned the ropes and rarely misses a day of work as our “Lighting Lab”. Please do not hesitate to contact us if you have any questions, comments, or concerns, or if you would like more information about us and our services. We are always glad to hear from you, and we look forward to working with you!